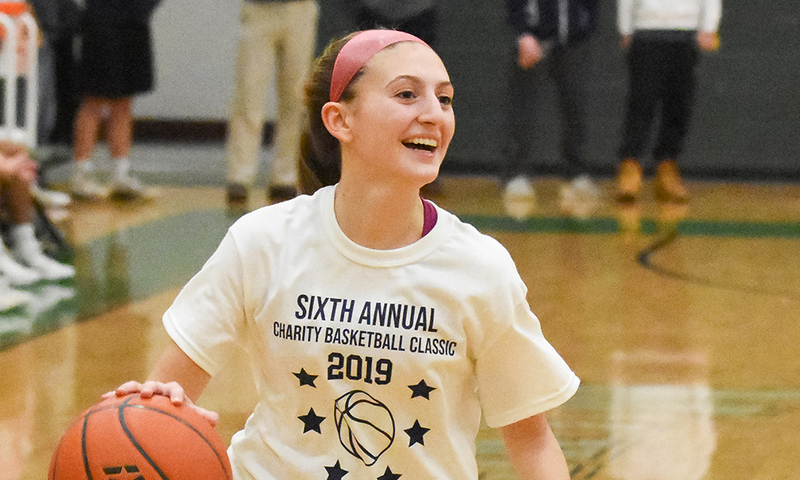 Click here for a Photo Gallery from the sixth annual HockomockSports.com Charity Basketball Classic at Mansfield High, 3-15-19. ATTLEBORO, Mass. – Those who were in attendance for the clash between #3 Attleboro and #14 Taunton certainly got their money’s worth. 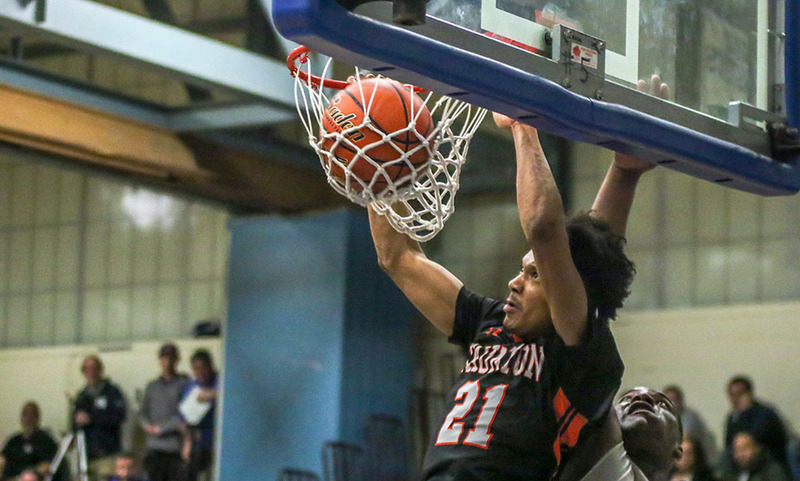 The Bombardiers and Tigers, playing for the third time this season, traded punches back-and-forth for the entirety of Tuesday night’s contest, one that felt at times more like a final than an opening round game. And just when it looked like Taunton was ready to land a knockout blow, the Bombardiers valiantly battled back. 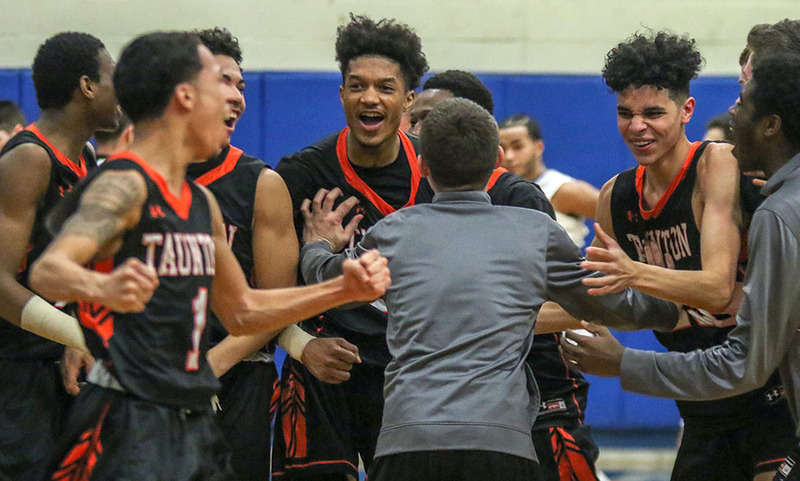 But in the end, Taunton’s second-half run, punctuated with clutch free throws in the final minute, proved to be enough as the Tigers earned their first win over Attleboro this year, 61-56. 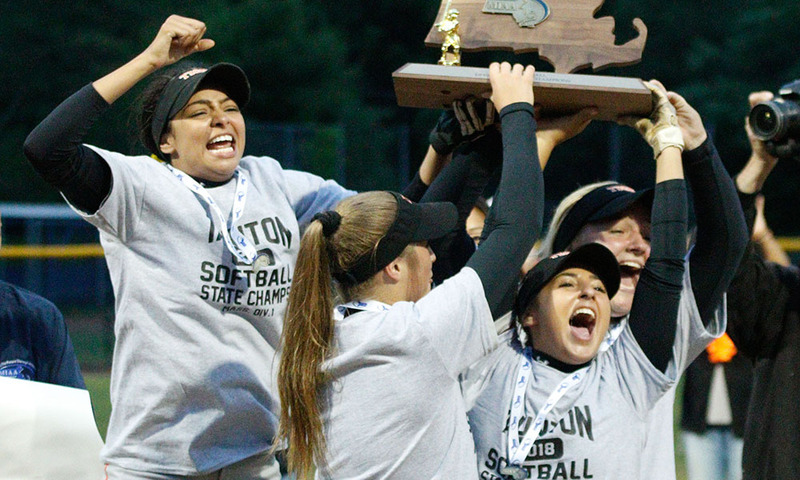 “They knew they could perform at a higher level,” said Taunton head coach Charlie Dacey of his team. “It’s good that they got it going at this stage of the season. I think the key tonight was they we spread the points around. Our half court offense was a little unorganized but when situations broke down tonight, we had guys hit some shots in some key situations. 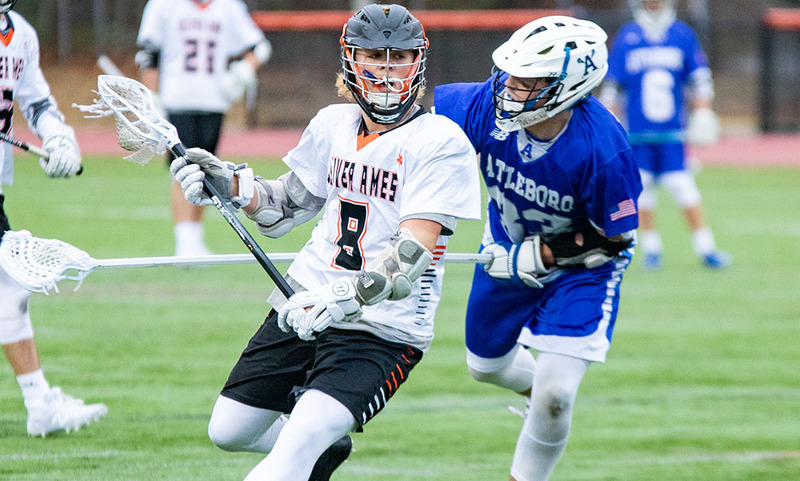 Besides Attleboro’s brief eight-point in the second quarter, the first 24 minutes of the contest was mostly a one or two possession game. It wasn’t until the late in the third quarter and early in the fourth that Taunton made its move. Trailing 43-31, senior Lou Vendrell (10 points) hauled in an Attleboro miss and alertly pushed the ball up in transition, finding classmate John Martins (eight points) for an easy layup. Two minutes later, just a player after drawing an offensive foul, Vendrell took a handoff from Wesner Charles (10 points, nine rebounds) and drained a three, giving the Tigers just their second lead of the half. With under a minute to go, Taunton’s defense got another stop, senior Mike Quinn grabbed the rebound and hit Dante Law (22 points, 12 rebounds) on an outlet pass and the junior used a two-handed slam to put Taunton up 48-43 heading into the fourth quarter. Attleboro opened the fourth with a bucket from senior Mason Houle (12 points, five assists) but Taunton’s run continued as Charles hauled in an offensive board and found Law for a three. Houle answered with a free throw but Law came back down and hit another three to make it 54-46. “It was timely shots, good stops, all of the above,” Law said. “We trust each other with the ball, so we’re able to spread it around. We talked about getting 10 points from everybody, and that’s what we what did tonight. “We were excited to get another chance at them. Coach talked about how it’s hard to beat a team three times so we went out there and just gave everything we had. After a scoreless two minute stretch from both sides, Charles put an exclamation point on Taunton’s run. The senior took a pass in the corner, found space on the baseline and drove to the basket, rising up and finishing with a two-handed slam while being fouled. His free throw gave Taunton a commanding 57-46 lead with 4:30 to play. But the Bombardiers refused to go quietly, getting a spark from a pair of reserves. Lorenzo Wilson converted back-to-back offensive rebounds, and Nick McMahon finished a layup after a pull-up jumper from Bryant Ciccio (13 points, eight rebounds) to make it 57-54. Taunton was called for an illegal screen, and the Bombardiers quickly got the ball into Qualeem Charles (14 points, six rebounds) for two, cutting the deficit to just one at 57-56 with a minute to go. Junior Naz Kenion (11 points, five rebounds, three assists) was fouled as he drove to the basket, connecting on both ends of a 1-and-1 to make it 59-56. Attleboro had a look to tie it with 20 seconds to go, but it was off the mark and Law came down with the board. Kenion was fouled again, and he sank the first or two to extend the lead to 60-56 with 12.5 seconds to go. Law tacked on a free throw in the final seconds. “The big thing playing Taunton is transition defense, getting stops, and rebounding,” said Attleboro coach Mark Houle. “They out-rebounded us, especially on the offensive glass and that translated into a lot of opportunities for them. In a big game like this, you can’t give good teams second and third chances. And their defensive pressure was good tonight, it was good all night long. That pressure, maybe in the second half, forced us into some quicker shots than maybe we wanted to. 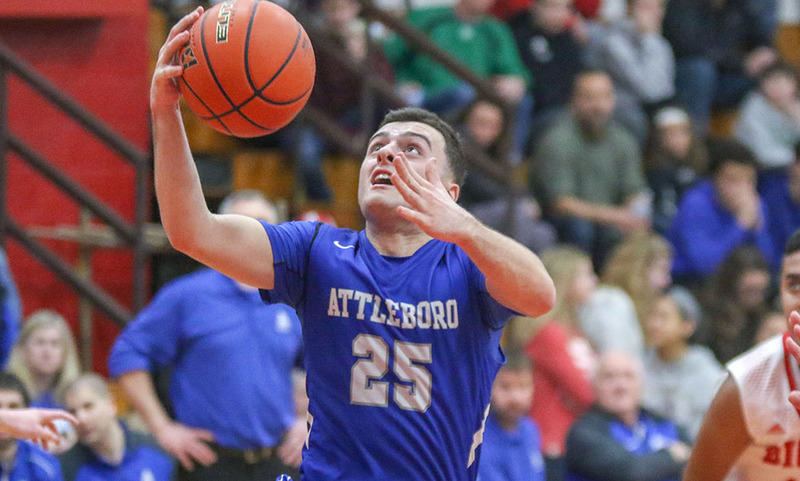 Attleboro opened had four players connect on a three-pointer in the first quarter with Ciccio, Houle, Kevin Velazquez (six rebounds), and Tim Callahan all hit from deep. Taunton kept pace though as Martins had a triple and Law attacked the basket with success, scoring eight points as the Tigers trailed 17-13 after one. Qualeem Charles and Callahan scored on back-to-back possessions to give Attleboro its largest lead of the game at 21-13. 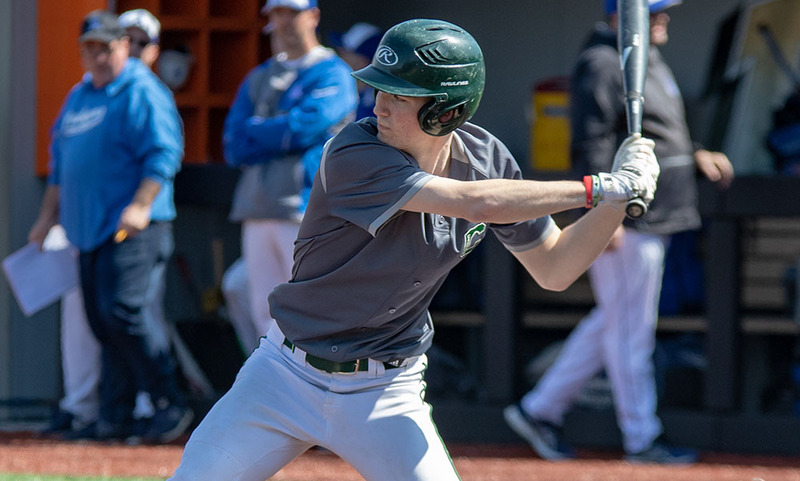 Taunton responded with an 11-1 run to take its first lead of the game. Kenion slashed to the basket, Vendrell hit a three and then a free throw and Martins connected on his second triple of the game. A free throw from Qualeem Charles tied it but Kenion was fouled and hit two free throws of his own to make it 24-22. The teams went on a bit of a scoring spree, trading three-pointers on back-to-back possessions. First Houle drained one from deep only for Vendrell to answer seconds later. Ciccio stepped up to sink one for a 28-27 advantage but Law responded on the other end to put Taunton up 30-28. Attleboro closed the half on a 7-2 run. Houle and Qualeem Charles converting at the rim while Ciccio broke a tie game with a triple to put the Bombardiers up 35-32 at half. The Bombardiers shot 7-for-12 from three-point range in the first half. “At halftime, we stated firmly to get them off of the three-point line, we don’t care what you do but get them off,” Dacey said. “We had some bad , but luckily we were able to force them further out into deeper threes. Taunton’s pressure on the perimeter worked as the Bombardiers connected on just one three in the second half, having a couple of open looks rim out as well. Attleboro closes the season at 18-5, finishing second in the Kelley-Rex division. It was the first loss at home of the season for the Bombardiers. 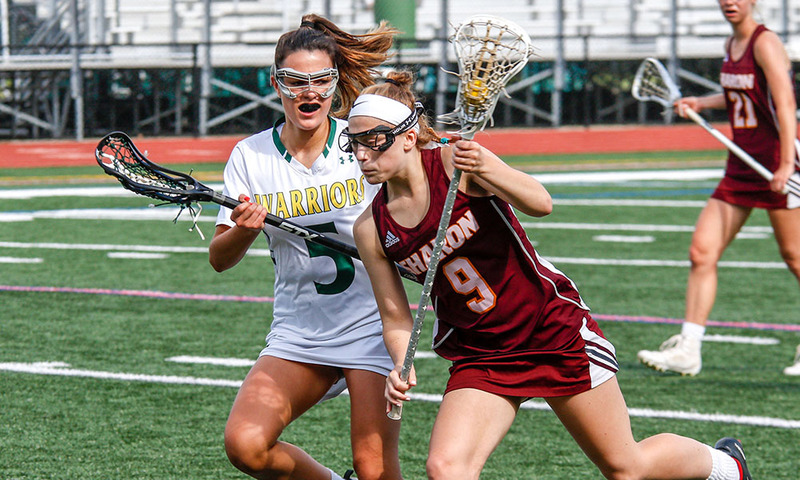 “This team has been resilient all year, we’ve had a good attitude in every game,” Houle said. “I knew in my mind, if we could have gotten a little momentum we’d be right back in it, and we did. It came down to the last couple possessions, and we had some opportunities but we weren’t able to get it tied or take the lead. Taunton boys basketball (14-8) advances to the D1 South Quarterfinal to take on rival Bridgewater-Raynham (13-8), marking the first team the two teams have played since the Tigers left the OCL and joined the Hockomock League in 2012. The game is scheduled for Thursday at 6:30 at Bridgewater-Raynham. Below are the seeds and matchups for Hockomock teams in the MIAA playoffs. Records listed are for MIAA tournament purposes and do not include exclusion games. Times and dates are subject to change and we will update this post with any changes. Seeding will be determined following Monday’s Super 8 play-in games. #1 Canton (20-0-1) will host the winner of #16 Dedham (8-8-4)/#17 Medway (9-10-2) on Wednesday, Feb. 27 at 7:30 at the Canton Ice House. #9 Oliver Ames (13-8-1) will face #8 Plymouth North (11-6-3) on Wednesday, Feb. 27 at 5:30 at Gallo Arena in Bourne. #13 North Attleboro (10-8-2) will face #4 Quincy (15-4-3) on Tuesday, Feb. 26 at 6:00 at the Canton Ice House. #13 Foxboro (11-6-3) will host #20 Mashpee/Monomoy (9-9-2) on Monday, Feb. 25 at 4:00 at the Foxboro Sports Center. 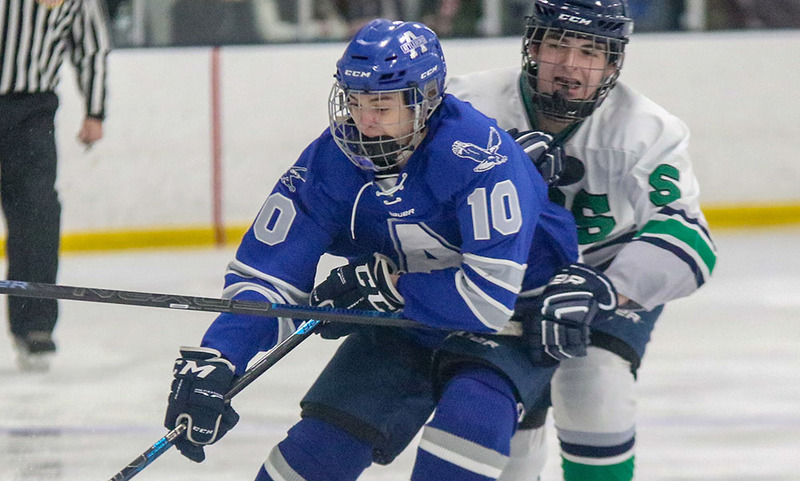 #17 Attleboro (10-8-2) will travel to #16 Nantucket (9-7-2) on Tuesday, Feb. 26 at 5:15 at the Nantucket Ice Skating Rink.